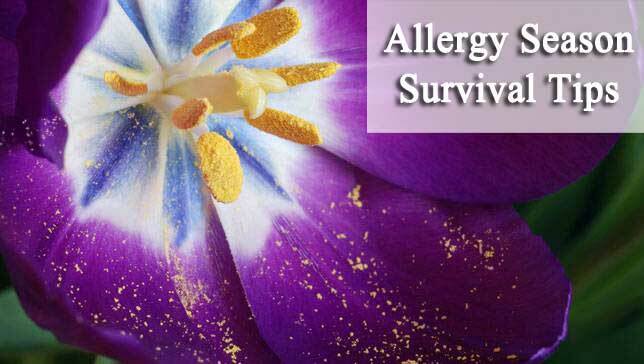 Due to numerous years of record-breaking levels of seasonal pollens, it is essential to have an allergy survival plan in place. But you ask Why such high levels? Well for starts climate change – the rise in worldwide temperatures and greenhouse gasses, the record amounts of precipitation, and lastly an overplanting of male plants have led to a longer allergy seasons. All these factors create the perfect storm for those of us that suffer from seasonal and mold allergies. But there are techniques to stay one step ahead for an allergy-free season! First, you need to know if you have seasonal allergies, and then you can customize a successful allergen prevention and management plan. Second, many sufferers don’t realize that medications often work better before the symptoms take hold. You may need less if started before peak allergy periods. One area that may be significantly affected if you suffer from allergies is sleep patterns. Allergy sufferers are often sleepy during the day, especially when on drowsiness-causing OTC medications or oral decongestants. The key to OTC medication is to get the right treatment to control your seasonal and indoor allergies, so you can breathe and sleep better at night. Cool eye compresses may improve the appearance and reduce unwanted swelling of the eyes due to allergy symptoms. Wear big sunglasses to block pollen from entering into your eyes and eyelids, especially on windy days. Change your clothing before going into your bedroom to reduce pollens from being brought into your bedroom. Shower and shampoo your hair in the evening if you have been out on high-pollen days to remove unwanted seasonal pollens and molds from landing on your pillow and bed sheets during the night. Wear a wide-brimmed hat to prevent pollen from landing on top of your head. Try avoid using hair gel or similar hair-care products that can act as “pollen magnets”. Try exercising indoors on high-pollen days (warm, dry, sunny and windy days and lower on cooler, moist, wet and “windless” days). When working in the garden or lawn mowing wear a pollen mask, use gloves and avoid touching your eyes and face. Try never dry clothing outdoors on high-pollen days, as pollen will stick to your linens, towels, etc. Many flowers will drive up your allergy symptoms, especially if you inhale their aroma up close. Try avoid the following plant if you have allergies: Daisies, chrysanthemum, amaranths, dahlia, sunflower, black-eyed Susan, zinnia, privet, and lilac. The following plants won’t aggravate your allergies and can and can be planted in your Allergy-Friendly Garden: Gladiolus, periwinkle, begonia, bougainvillea, iris and orchid. At home or when driving, keep all the windows closed and put the air conditioner on “re-circulate the air” to keep out the pollens. Clean the filters in air conditioners frequently during the allergy season. Enjoy the great outdoors this season with these simple, practical and proven ways to stay allergy-free! A new find to add to the ever growing list of allergens… Yip, another item you can’t even see to worry about. It’s called Basidiomycetes and is a class of fungi that forms part of puffballs, brackets and very yummy mushrooms. Basidiomycetes is predominantly an outside fungi however its spores do have the potential to migrate in doors. Respiratory allergy sufferers such as those that have asthma have been found to be highly sensitive to basidiomycetes. Bird poop can even be fatal…. Yip, it’s true, Cryptococcus neoformans is an airborne fungi that often growths on old bird poop and can result in a fatal systemic infection in those individuals who are severely immune-compromised. This is due to the air-borne basidiospores found in the Cryptococcus neoformans that results in an infection of the lungs called cryptococcosis. Decaying wood, animal dung and decaying leaves are also an ideal habitat for Basidiomycetes, so be wary the next time you pass a toadstool or skewer your next scrumptious mushroom as it could be fungal allergy causing.